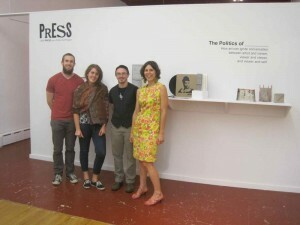 The Politics of _______________ August 29-September 22 and staff with Founder and Curator Melanie Mowinski on the right. 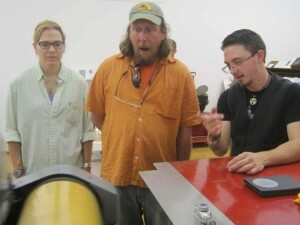 letterPRESS as a Public Art Project in North Adams, Massachusetts. This looks like such a cool place. The Vandercook press is right in the Gallery space, which makes it easy to add demonstrations to the opening. In fact, let me pull a photo of the staff doing just that on opening night of The Politics of _______________ . I believe the surprise is related to how this is an automatic Vandercook. The carriage has left the feed board quite suddenly! photo by Michaela Jebb.